FIELD’s microTracker census is due on September 30, 2018. Fill it out and treat your staff to lunch. Attending the AWBC meeting in Tampa was inspiring and professionally enriching. Thanks to all of the California WBC staff who attended and shared their successes and challenges. It was my first time, as it was Mega Sugianto’s, AnewAmerica’s new WBC director in San Jose. She posted “folks have challenged me to shift my paradigm and think bigger than what’s ahead.” Her short post encapsulates the biggest takeaway for me – women need to think bigger. 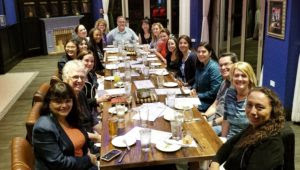 The California WBCs had the honor of dining with Kathy McShane, the leader of SBA’s Office of Women’s Business Ownership. She discussed mindset with us and encouraged us to set our individual success goals higher than we first thought possible. Another big takeaway/affirmation for me was to reinforce the importance of acting from a place of hope rather than from a place of fear. Hope leads to love and fear leads to hate. Love leads to building up and hate leads to tearing down. Our world needs more love, and this extends to our professional life. The affirmation is that the work we do in the micro sector is based on building hope for people to imagine a better life for them, their families, and their communities. Bonus: google the love/hate rice experiment. While not completely scientific, the conclusion is interesting to ponder. And my last big take away was the power of positive thinking. (Yes, cliché’, but indulge me.) One question has stuck with me from one of the sessions. We know that bad things happen to good people, but what do good people do with the bad things that happen to them? I had a bad thing happen to me once and have previously thought about the situation in the negative, but the facilitator had us think of the event in terms of how the experience enriched us, what were our strengths and what we are hopeful about in retrospect. Reframing that experience in the positive instead of dwelling on the negative was enlightening and freeing. When we hold onto those negative patterns we tend to repeat them, and I’m grateful to let those go. Happy 30th anniversary to the AWBC and HR 5050! Did you miss last week’s webinar on how your organization can support entrepreneurship among military families? Watch last week’s webinar – – Engaging with Veterans: Entrepreneurship and the Military. It gives tips on how to engage more military-connected business owners in time for Veteran’s Day and Veteran’s Small Business Week (November 5-9). Asking clients if they are a veteran or not, doesn’t work, but asking them if they served in the military does. Melanie Rae, CAMEO’s WOVEN Program Director, can help you prepare for whatever it is you might want to do. Email me and I’ll connect you. Watch the webinar – Engaging with Veterans: Entrepreneurship and the Military. technology tools for business assistance. Future topics include: lending platforms, serving the gig economy and more technology tools for business assistance. Member Kudos: Congratulations to the following CAMEO members who received CDFI Awards for FY 2018. AmPac Tri-State, California Capital, California FarmLink, EDFC, Feed the Hunger, Fresno CDFI, Main Street Launch, Opportunity Fund, PACE, and Vermont-Slauson LDC. CAMEO in the News: Read CAMEO’s op-ed with Small Business Majority – Another Voice: Truth-in-Lending bill would benefit California’s small businesses. New Report: The SBA recently released a report on small business lending based on data from banks. Surprise, surprise, The largest growth was in loans under $100,000, which grew by 7.0 percent from June 2015 to June 2016. For Your Clients: CAMEO is partnering with the Federal Reserve to conduct a Small Business Credit Survey for both pre-start and existing businesses, and we’d like your clients to participate. This short survey will take approximately 9 minutes and will ask about business conditions, financing needs, and credit experiences. Please click this link below to complete the Federal Reserve Small Business Credit survey. The survey closes December 8, 2018. Professional Conference: Join CalNonprofits for their policy convention – Nonprofits Standing Up for California – on Thursday, October 18, 2018, in Los Angeles. The agenda includes a discussion on Census 2020 and a keynote by Vu Le, the creator of NonprofitAF.com. Professional Development: CALED is partnering with the California Academy for Economic Development, Fresno State, and the University Business Center, to bring you the Introduction to Economic Development Certificate Program (click the link for the agenda and more information.) The class will be held October 22-25, 2018 in Fresno. For Your Clients: Prospera hosts Second Annual Summit for Latina Entrepreneurs, Saturday, October 27, 2018, from 8:30 am – 6:30 pm. The focus of this year is to connect over 100 Latina entrepreneurs from across the Bay Area to each other and to leaders in the women’s economic empowerment space. Professional Conference: Save the date for Asset Funder’s Network Annual Bay Area Asset Building Conference on November 1, 2018, in Oakland. Professional Development: The Office of the Comptroller of the Currency (OCC) will host two workshops – Credit Risk and Operational Risk Workshop – at the Holiday Inn San Francisco-Golden Gateway, San Francisco on November 6-7, 2018 for directors of national community banks and federal savings associations supervised by the OCC. For Your Clients: Samaschool’s 1-hour Gig Economy Essentials training is newly available on the web to anyone! It covers critical topics like freelancing vs. employment, where to find freelance work, and how to attract clients. New Report: Accion and Opportunity Fund conducted a study to understand how small businesses perform after receiving capital from mission-based lenders. They tracked 500 clients to observe sustainability, sales, profit, and employment capability. Some of the highlights: the majority of small businesses that obtain loan funds from mission-based lenders remain in business 2-3 years after receiving capital; over 50% increased in sales and profits, and small business owners who received loan funds experienced increased feelings of competence and confidence. The findings present a case for the importance of mission-based lenders to the goal of creating financial inclusion for underserved entrepreneurs. New Report: The new 2018 State of Women-Owned Businesses Report commissioned by American Express does a fantastic job of measuring successes. Four out of every 10 businesses in the United States is now women-owned. It also shows us the challenges. Women-owned businesses still see only 4.3% of total revenues and 8% of all employment. New Report: Emergent Research released “MBO Partners State of Independence in America,” a study which offers insights into the growth of the independent workforce. New Resource: The California Reinvestment Coalition has released a guide for banks on how to better serve immigrant communities. New Resource: Credit Builders Alliance released Achieving Credit Strength: A Toolkit for Supporting Returning Citizen Entrepreneurs. Disaster Prep Resources: Download Operation Hope’s Personal Disaster Preparedness Guide and FEMA’s Emergency Financial First Aid Kit (EFFAK). Advocacy Tool: Prosperity Now has an Advocacy Center where you can find information on your legislators and how they voted on issues that affect small business and the asset building community. 1. Visit their Advocacy Center. 2. Click the “My Legislators” button. (If you are new to the Advocacy Center, enter your contact information on the next page.) 3. Select the legislator from the drop-down menu (state and federal legislators are listed) and explore. Job Opportunities: JEDI, California Farmlink, Cutting Edge Capital, Chinatown Service Center, Pacific Community Ventures, Women’s Economic Ventures, and Santa Cruz Community Credit Union are hiring! Please check CAMEO’s job page for more information and other listings.